A combination of herbs and resin, flowers and honey and fragrant oils make wonderfully scented Goloka aromas. A single incense stick has a burning time of on average 50-55 minutes. 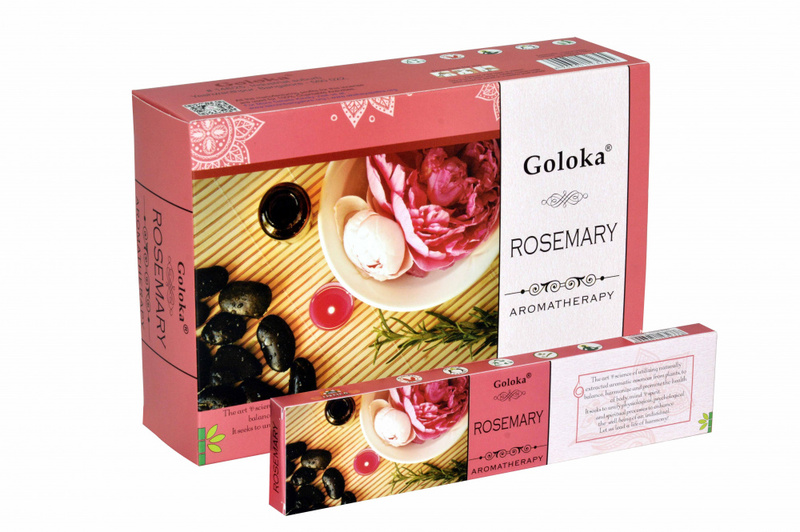 Goloka Aromatherapy Rosemary is a premium quality masala incense made in India. It has a delicate sweet herbal fragrance. The rosemary note is very mild and nowhere near as strong as the smell you get from fresh rosemary leaves. Eco-friendly packaging and made from all natural ingredients. Each packet contains approximately 12 - 14 sticks. Each stick is approximately 20cm (total length) and has a burn time of roughly 50 - 55 minutes. Exact burn time can vary depending on a number of factors and your burn time may be a bit longer or a bit shorter. Did you know that rosemary raises blood circulation and digestion? That’s why it has a refreshing effect on the dry exhausted skin. Rosemary oil is often processed in beauty products because of its beneficial properties. Her smell also has an extremely positive effect on our mood, since she comforts and brightens up. Botanical Name: Rosemarinus Officinalis, With its warm and penetrating aroma, is one of the most stimulating fragrances used in aroma therapy. Rosemary was one of the earliest plants to be used in medicine, as well as for cooking and for religious rites. During the middle ages it was used to smoke out devils during exorcism. It has a very strong antiseptic action so is terrific to use in aroma therapy recipes for cleaning. The Rosemary has always been one of the most used in traditional herbal medicine plants. With its intense and warm aroma, rosemary is one of the most stimulating scents used in aromatherapy. It has a very strong antiseptic quality and is an excellent purifier. 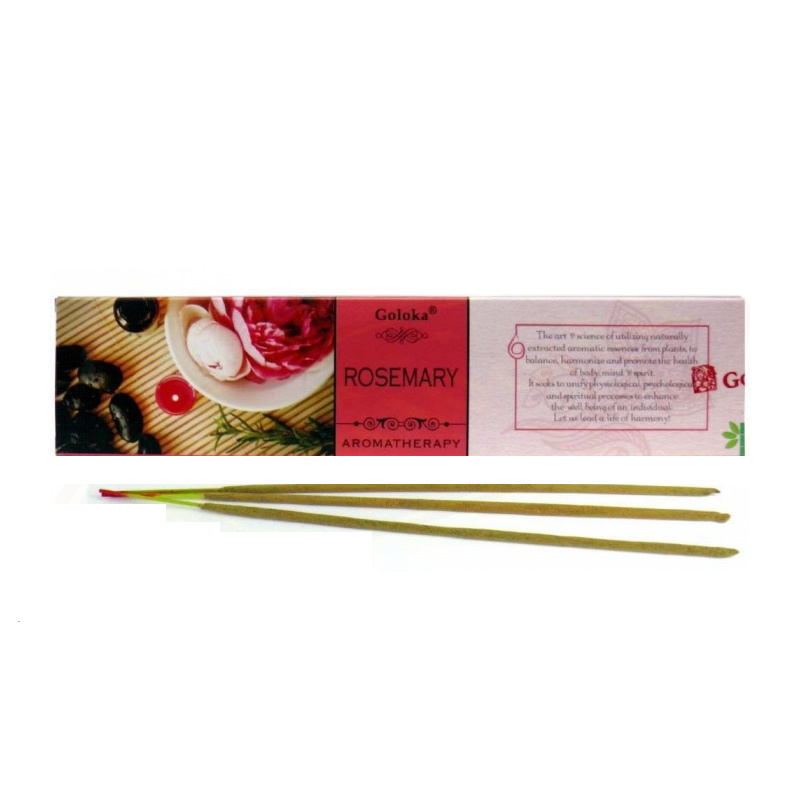 High quality Goloka Rosemary Aromatherapy Incense sticks are handmade by artisans who roll them individually using natural, organic and sustainable materials. 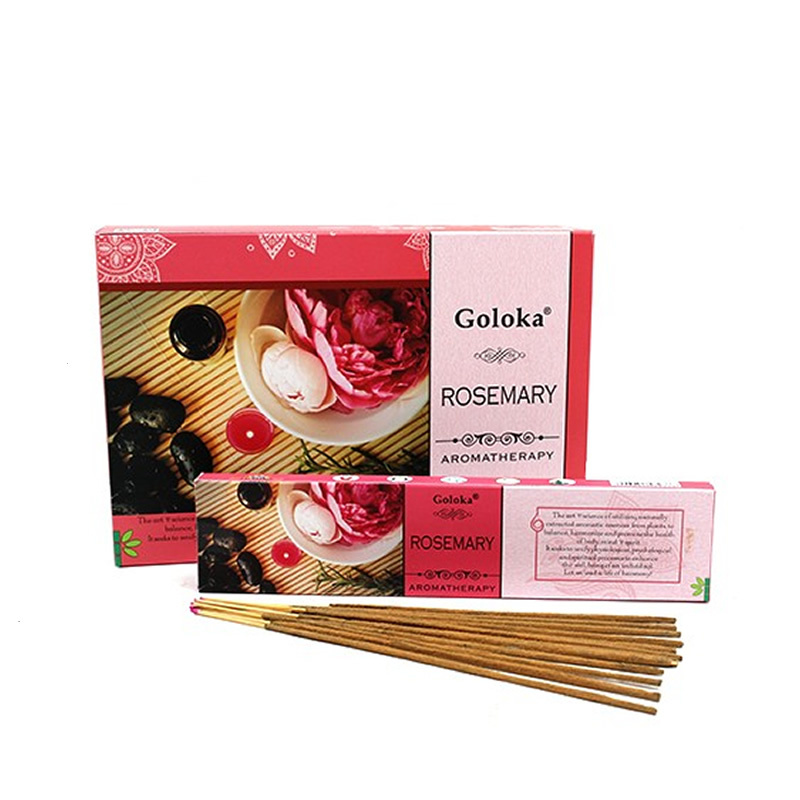 These characteristics make the Goloka Rosemary Aromatherapy incense a superior quality product with an enveloping aroma that offers moments of pure relaxation for the soul and body. Particularly suitable for rituals and meditations aimed at purification. Plant the incense stick somewhere where it stands firmly, such as a bowl with rice or earth or use an incense holder. Light the tip of the stick with a match or lighter and wait until it ignites. You can leave it on for about 10 seconds and the flame will probably extinguish itself, if not: blow it out gently. The cinder will continue to glow red, so you know that the incense is burning. If it becomes axle gray, light it again. The odor is almost immediately released together with the smoke. It’s the safest to burn the incense in a specially designed incense holder. Do not have a holder yet but you would like to purchase one? In the collection of Mystic Dreamer you will find countless incense holders/plates and incense boxes that are suitable for to use. These can be found in different colors, themes and different material types, for example from (mango) wood and aluminum to metal or copper.